This theme is what you come away with after watching the film (Farhan Akhtar’s portrayal of Milkha Singh is absolutely brilliantly!). 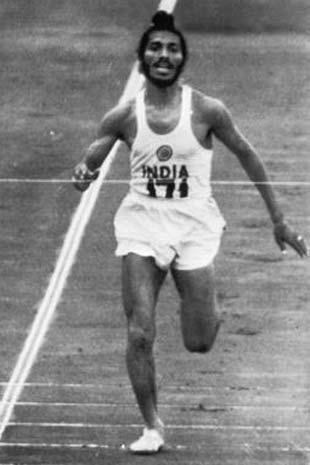 Afterward, as I researched on Milkha Singh, my awakening was further enhanced. Here is a person who had to face unimgaginable strife as a child, had to overcome temptation to focus, had to deal with a venomous opposition, and yet triumphed only because he refused to get bogged down by anything. Neither by circumstance nor by people. Neither by failure nor by success. He just kept his focus on the one thing that he knew how to do very, very well – his running. For much of his after-track Life, Singh has been leading a quiet Life, preferring to stay away from the limelight even when it was pointed at him. Even now, as his Wiki Page and the movie’s Wiki Page reveal, Singh is believed to have sold the movie rights of his Life’s story to Mehra for a token Rupee 1. Singh instead has asked for a share of the profits the film is making (and it is raking it in!) for the Milkha Singh Charitable Trust which was set up in 2003 to assist underprivileged and talented sportspersons. Singh believes that if the film could “inspire young Indians to aim for and secure that elusive gold in an individual Olympic track event”, that would be reward enough for him. All of Singh’s medals, won in championships across the world, have been donated to the nation and are on display at the Indian sports museum in Patiala. Although Singh and his wife Nirmal Kaur (a former captain of the Indian women’s volleyball team) have three daughters and a son – the famous star golfer Jeev Milkha Singh, the couple adopted, in 1999, the then 7-year-old son of Havildar Bikram Singh, a soldier who laid down his Life in the Battle of Tiger Hill, during the Kargil War. I am just too moved by Milkha’s Singh’s story. For it is not often that you encounter someone who’s Life is his message! Whatever cinematic liberties Mehra may have taken with his biopic, the fact remains that but for his vision and effort, many of us__you and me included__will not pause in our rat races to draw inspiration from the Life of a man like Milkha Singh! I am reminded of these immortal lines by the famous Urdu poet Mohammed Allama Iqbal (1877~1938): “Khudi ko kar bulund itna ke har taqdeer ke pehle, Khuda bande se khud pooche, bata teri raza kya hai!” It basically (not literally) means: “Make your Life so unputdownable (through selfless living) that before your next (lifetime) destiny is cast, the Creator pauses to ask you for your wish (intent)”!